At the National Brain Aneurysm & Tumor Center, we have cared for patients from all regions of the United States and from countries across the globe. Our approach and results have garnered recognition from top centers throughout the United States and internationally. Complex cases are referred to us on a regular basis for consideration, particularly those that have failed treatment or been turned down for treatment elsewhere. When it comes to complex neurosurgery, experience matters. And experience matters most when dealing with very complicated and very delicate situations. Ask yourself this question: Who do you want repairing a complex aneurysm in your brain? A surgeon who operates mostly on the spine and three or four times a year repairs an aneurysm, or a surgeon who operates on brain aneurysms three to four times a week? This is exactly the question people should be asking a neurosurgeon when they are considering neurosurgery for an aneurysm. How many aneurysms have you treated? How many do you treat per year? Have you published outcomes in a peer-reviewed journal so that you can verify independently their actual results? This does not mean that a general neurosurgeon cannot clip an aneurysm. But if a neurosurgeon had a brain aneurysm, they would almost certainly go to an expert neurovascular surgeon to have it treated rather than undergoing surgery by someone who only treats a few cases a year. There is no substitute for experience. It doesn’t matter if the hospital where you’re having surgery has treated a thousand aneurysms if your surgeon has only treated a small number. 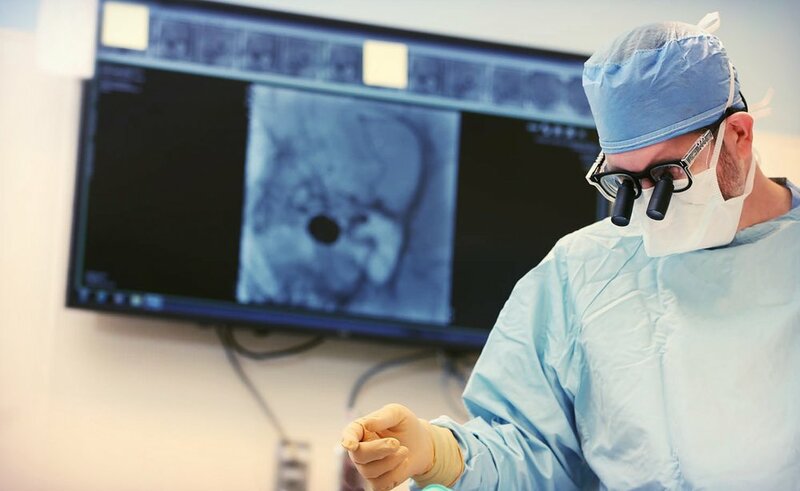 Eric Nussbaum, MD, has treated more than 2,000 brain aneurysms using open surgery, and our endovascular colleagues have treated a similar number of patients using minimally invasive endovascular techniques. Our current team has evaluated more than 10,000 brain aneurysms over the past 20 years. The team carefully reviews and evaluates each case to determine the best approach for the individual patient—open surgery, endovascular coiling or stenting, or observation with follow-up imaging studies. We have treated more than 1,000 vascular malformations of the brain using open surgery, embolization and CyberKnife stereotactic radiosurgery. We have performed more than 500 brain bypass operations making us one of the busiest centers in the country performing this operation. We have treated more than 500 acoustic neuromas, having performed open surgery on 400 cases, and we have treated more than 1,000 other skull base tumors, predominantly meningiomas. Of note, Leslie Nussbaum, MD, PhD, is the only neurosurgeon in the region who has dedicated her career to stereotactic radiosurgery, having treated more than 1,000 cases over the past 15 years.